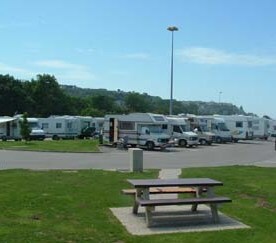 Situated near the campsite "Les Boucaniers", this area contains 61 pitches. Different services are provided (water, electricity, sewage disposal, picnic tables, bread delivery in summer). This area is open all the year. For 2017, the tax is paid for 24 h : 10€ (including all taxes). It is situated close the funicular on the Tourist Route. It contains thirty parking places. The price for camper-van parking is set in 2017 to 6,40 euros every 24 hours (including the staying tax for two persons) The parking-meter will deliver a ticket (payment by coins only). The charge for water and electricity is 2,30 euros (the payment is made by bank-card only).